their dizzily sweet fragrance drifted up to the window on the morning wind." I've been thinking back over our trip to P.E.I. recently. It was almost 2 years ago. Perhaps seeing my lilac bushes and the tightly closed buds triggered my thoughts, for Anne loved lilacs. 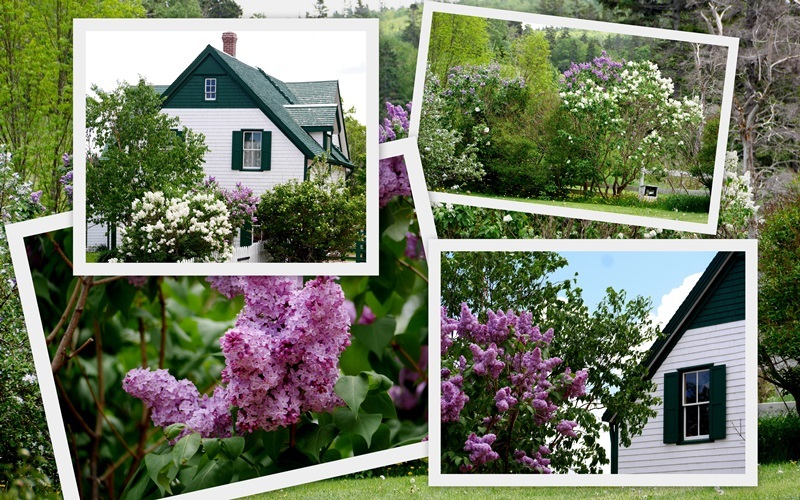 I was happy to visit Green Gables while the lilacs bloomed. Here are some photos from our visit, most of which are included in the original post. I'm including some quotations from L.M. Montgomery's books, most of the quoting Anne. Anne does make me laugh. In another part of the story, she says that she is many different Annes. I find myself nodding in agreement, do you? There's the quiet me, the boisterous me, the Nana, the Mom, the daughter, the half of a marriage, the teacher, the gardener, the one who laughs herself silly, and the one who cries at parades. Friends took us out for a lobster supper one night and then to Cavendish Beach with its red rock cliffs that are slowly eroding away. Driving around the Island was such a delight. The fields were just beginning to green up, some had not yet been planted, and I could envision Matthew working away and Anne going out to call him to supper. Dishes are very utilitarian, but both useful and beautiful, as the dishes in the dresser in the kitchen show. Finding delight in the ordinary is something I've tried to cultivate in my life. It is a beautiful world we live in, in spite of the horrors that go on every day. The terrible things affect us all, in big and little ways, but I believe that beauty, especially that of the created world is restorative. St. Paul encourages us to think about things that are true, noble, right, pure, lovely, admirable, and excellent. Good advice, don't you think? And one more quote to close this rather meandering post that is a collection of my disjointed thoughts. “Isn't it splendid to think of all the things there are to find out about? It just makes me feel glad to be alive--it's such an interesting world. It wouldn't be half so interesting if we know all about everything, would it? Stunning lilacs & green outdoors & so beautiful & romantic indoor decorations <3 Happy Monday Lorrie! I would love to visit PEI one day when the ilacs are blooming, Lorrie! I loved reading Anne of Green Gables when I was young and still have my book to pass on to my granddaughters one day. I read Anne when I was much younger, and loved her descriptions of the ways in which she saw herself. What an interesting visit. Yes, seeing the little meaningful things, the pretty amongst the dull, the kind amongst the unkind....is so very important in our lives. A joy to visit and be reminded of the beauty around us. A meander such as this is something to be savoured, I so enjoyed following along. I have to admit that I've never read Anne of Green Gables and had to google P E I, but I did enjoy seeing it through your eyes. I adore Anne. Your photos are so beautiful and go so well with your thoughts and Anne quotes. A wonderful visit with Anne through your eyes. Very special! And, yes, I think we are made up of multiple "us" ... good and bad! Lovely images. Happy Monday! I always loved Anne of Green Gables literature. She was funny and could make me laugh at myself at times. Who are we really anyway? We are like pieces of a jigsaw puzzle, shapes and sizes which sometimes take a while to fit together to form the finished picture. As I age I find myself looking back trying to recall all those different 'Marys' I have been over the years. (If you see my post today I've shared some my personal story!). Photos are lovely - I was in P.E.I. many years ago - we drove there from Massachusetts - did all the Maritime provinces. It rained such a lot and the red clay soil made rivers of the roads on P.E.I. We could barely make out a thing whilst on Cape Breton due to pea soup fog - this was in mid-Summer! Have a fabulous week Lorrie - sorry I've been missing - so much going on and getting ready to leave soon. I would sure love to visit here one day. Thanks for the photos. I think our love of beauty is projecting to our hope in a new heaven and earth someday. And to slow down and appreciate details just makes our lives all the richer. Beautiful shots from your tip and lovely lilacs. Lorrie, you were so fortunate to be there at lilac time. It really must have been intoxicating. Your words as well as the photographs are inspiring, as inspiring as Anne's "like pearls slipping off a string." The Philippians verse is one of my most favorite, sometimes hard to remember to practice in our world today but vital to my mental, emotional and spiritual health. Love your meanderings in Anne's world, your own delights and the scriptures you mentioned. You are a true kindred spirit. Love this post. Yes, I'm a few different Ellens. I've probably said many times over that PEI is on my bucket travel list. It's fun to see bloggers share about their trips there. Hope you have a good week! Love those quotes, slipping like pears off a string, from such a gifted author! She has such a way with words... can't we just all relate? Yet I would not have thought to put it that way! I've really enjoyed this...reading the familiar quotes and seeing the photos. It's at the top of my list of places I would love to visit. I can just imagine walking through the tall grasses near the sea...with the wind blowing through my hair. (I need longer hair and some ribbons! heehee) Love your post. Thank you so much! Hugs! These were enjoyable quotes and accompanied the photos of PEI nicely. When I first moved away from home (about 2 miles from my parents on the "far side" of a tiny hamlet! ), it was a rented farmhouse and there was an enormous, ancient lilac tree growing outside my bedroom window. It was wonderful in springtime as the tree grew right up to my second story window and the smell drifted inside to me. I wonder if you have ever read Lucy M. Montgomery's autobiographies? I believe she did two books, although I have only read one. It was very interesting, as her own life and that of Anne blur together here and there. I loved reading the quotes and seeing the pictures. We visited there in 2006. It was September and we had clear skies. I read all the Ann books while attending elementary school. To be in Ann's house and on the farm was a dream come true. Thankyou for your post. Your photos are just lovely and go so well with your thoughts and the quotes. Beautiful photos of your visit to Anne's island home. The last time we were there was 9 years ago and we didn't visit anything Anne. We did take our kids to the Green Gables house when they were little though, and it was lovely. I would love to visit PEI again for a few days. It will be a while before the lilacs bloom here! I hope you have a lovely week Lorrie. What a sweet post - and lovely photos. Your dishes are wonderful too - and I agree, it is great to find the simple pleasures in our world - they help us to get through the tough times. How I would love to visit this part of the world. Love Anne's quotes too, plus lilacs!!!! Waiting for my closed buds to open soon. Now if only the sun would come out. Lorrie, I love all things Anne! How wonderful that you were able to visit! I hope to one day. It has been many years since I visited PEI and spent an afternoon at Green Gables with my then-little daughter. This post and Podso's remind me of how much the books of my childhood meant to me. I enjoyed your post, Lorrie -- hope you have a good week! Loved our trip to PEI a few years ago and was fascinated by the kitchen garden at Green Gables - planted just as it would have been back in the day. I've been watching the new series on television, very modern in topics at times but always the same Anne and her words of your quotes. I met a gal from BC this morning at Bible Study, she'd flown out to surprise her mother, who is a member, for her birthday. We had a great time discussing gardening and the humour of her 3 chickens. Visiting Anne in PEI was always a dream when I was young. I never got there ... yet. But looking at your stunning photos of your own visit feels fulfilling in a small way. So happy you shared your visit with us. 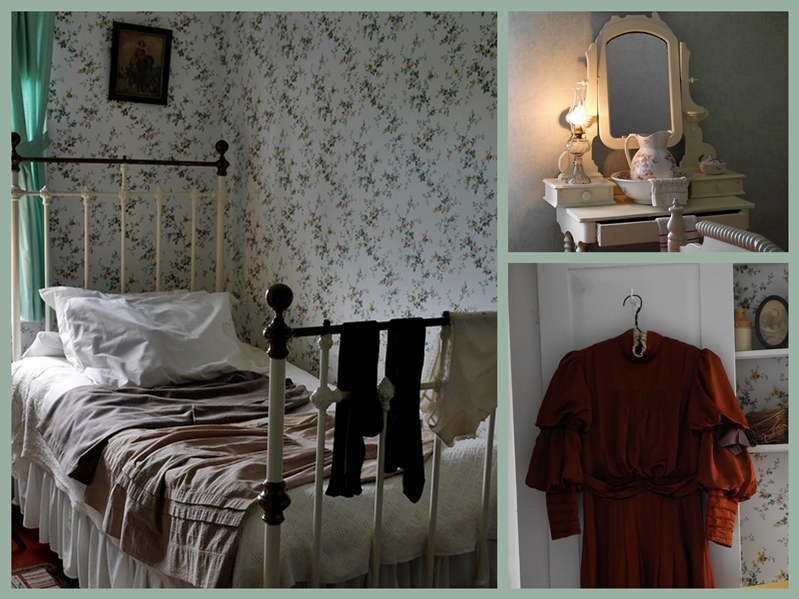 PEI and Green Gables is on my bucket list so I really enjoyed your flashback travel to Anne's home. I've been watching CBC's new "Anne" series and have been impressed by the show's level of realism of the period. Thanks for this lovely post. I visited PEI years ago and would love a return visit. Lorrie, Anne is such a precious character. Always love to be reminded of her take on life and it's challenges. Thanks for sharing. Sylvia D.
Thank you for sharing your visit! I love those quotes, especially the one about knowing her own mind. :-) I myself never read all of the Anne books, but my daughters certainly did.... and you make me want to go back and enjoy one or two now. Beautiful post Lorrie! I enjoyed it all....gorgeous photos and thoughtful quotes....thank you for sharing. Lorrie, I lovelovelove this post! I, too, have always tried to cultivate "delight in the ordinary." One of my girls and I watched the first Anne movie the other day when she had a day off of school. Such a GOOD story. Thank you for sharing again your photos and quotes of of course the reminder of Paul's words. I took a photo and put his words on it once as they are a part of my spirituality. My grandmother actually made that trip to PEI in the early 90s, and I have her hand-written journal, which is of course a treasure especially now that she's in heaven. She describes where they stayed, what they ate, what the countryside looked like, and so many other things... all in vivid detail. She brought me back a framed photo of the house looking exactly as your photos at the top. "Anne," as we affectionately call the books and movies at our house, has become an institution with my kids and me. We all quote the lines to one another and think back to our times watching those gorgeous Sullivan Entertainment movies with such fondness. And, yes, the fact that there is so much humor in all of them is one of the very best things about them. n interesting visit for you. Anne of Greene Gables by favourite Childhood books.